I hit a wall today, when someone introduced a blatant anti-American comment on Twitter and I was not amused. This is one of those things that I was not at all prepared for when I moved to England nearly five years ago (gasp!). After living for many (30) years in an America full of Anglophilia, I sort of assumed that the former monarchist leaders of our state shared the same sort of historical affection for us that we had for them. The last few weeks have demonstrated the fact, more clearly than ever, that I was wrong. We all have witnessed the great Anglophilia that took place in the form of the Americans' obsession with the royal wedding a few weeks ago. Although a few arguments tried to logically argue against an American being obsessed with the wedding of Prince William and future princess Kate, this seems to have fallen largely on deaf ears. I am, through the expat community, very much aware of a number of blatantly Anglophile blogs (here, and here, for example). So in this general framework of Anglophilia, it still comes as a surprise to me that, while Americans can be classed as generally England-loving, here in England it is politically sound to be America-hating. Or, at very least, America-resenting. Here is the example of the tweet that sent me over the edge today, in terms of Anti-American sentiment and frustration. I note now that it was only the latest in a series of such things. I do not harbor any long-standing or particular bad feelings to this particular tweeter. But it did put me into the place where my blood was boiling and I was flat-out angry, after nearly five years of living abroad. We, as English-speakers, have to adapt to the fact that this is a language based in other languages and one that evolves quickly. I think this is really cool. I love that my language has no problems with invention of words to address new technology, because I am a scientist and sometimes I really need those new words. I’m unclear as to what is to be gained by “blaming” any English-speaking country for new words or compounds that happen to make it into general usage. Words only become popular because people are seeking a short-hand term to describe a concept that is in need of expression. More importantly, I think, it is detrimental to the language as a whole to demonize words as being “American” in origin, when that distinction is being seen as “ultimately bad” without context. If a word gains traction in the larger English language, that language being spoken across many institutions including science, why can’t we live with it, no matter the origin, if it expresses the concept that we wish to express? And in that vein, why should we care if there are differences in the words used in British and American English for the same concept, when we are most likely next to deal with the important translation effects that result in trying to convert between English and Chinese? Neither “English” nor “Chinese” is a single dialogue, so we have years of mis-communication to ensue. Can’t we at least stop arguing within our own ranks, of supposedly “English” speakers, and try for a degree of communication instead of petty disagreements? One of the more interesting aspects of being in China for nearly two weeks was in being completely shut out from most conversation. Very few people spoke any English at all. And why should they? I was visiting their country. It was my problem to not speak their language. Thank goodness for my sister’s Chinese fluency, I don’t know how anyone could travel in China without having a fluent guide. 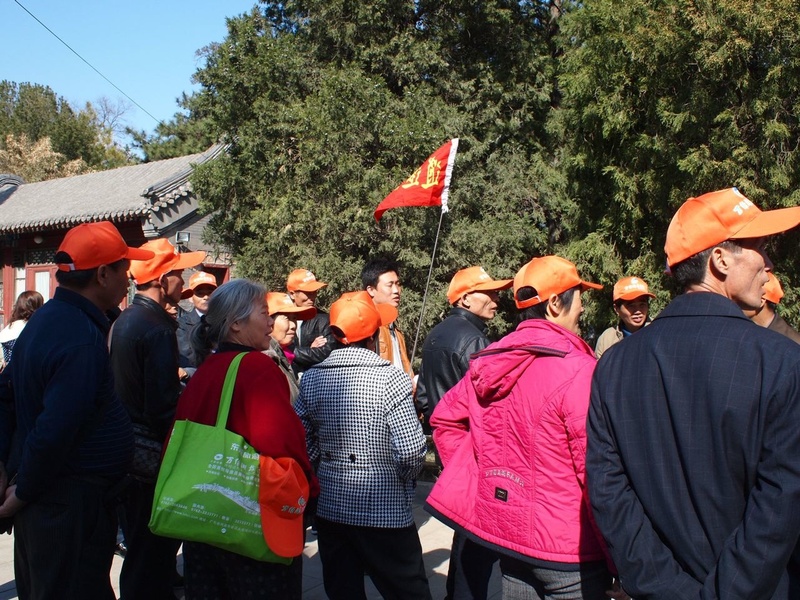 For this reason, there were tour groups (both international and domestic tourists) in matching hats everywhere, often affiliated with cruise ships. If you ask me for my own unique definition of hell, it would involve matching hats, organized tour groups on tight schedules, being ferried on and off coach buses, and cruise ships. Not my style at all. So kudos to my ever-patient sister for being an awesome guide and translator and allowing me to see China without having to take part in my own greatest nightmare. Don’t get me wrong, if your only choices are “see China in a tour group” or “don’t see China” I’d go for the former, I just felt fortunate to be able to see China with the flexibility and planning oversight unique to being in a duo with a fluent Chinese speaker involved. Even if I felt like an idiot most of the time just sitting smiling while she had long conversations with the locals. The younger generations are mostly learning English in school, and it was they who were most bold: especially in the more off-the-beaten-path parts of China, it was not unusual to be the only Caucasians around for miles and for young Chinese people to walk up to us and say “Hello.” If we said anything back, or even smiled in their direction, it caused fits of giggling. The young ones who did speak some English were, in these circumstances, incredibly likely to ask if they could have their photograph taken with us, as though we were some strange foreigners (which we were) but I admit it made me feel sort of like an exotic zoo animal. Our rule of thumb became to say yes to the photo requests from young (University-aged) girls practicing their English, but as two young females we decided that some of the requests for photos from older guys were just a little bit creepy. China is, of course, the People’s Republic of China, the currency is called the People’s money, and our first hotel in Shanghai was in People’s square. So this one was everywhere, and it was useful for me to remember. After seeing some Bronze-age inscriptions at the Shanghai Museum I became obsessed with understanding how modern Chinese characters evolved from early Pictographs, and I found a few great books to bring home with me. So I can casually indulge in this fascination over the course of the next few months, as I reflect on my trip. Since I’ve been back in my own bed, my dreams have mostly been set back in China. Clearly there was a lot to see and process, and my brain is still working hard on it. But with the language difference, comes the inevitable funny translations, so I’ll leave you today with one of my favorite giggle-inducers. Hey, I’m sure if I tried to translate something into Chinese the results would be equally hilarious. China was not on some big “places I want to visit next” list for me, but a great opportunity that arose because of the fact that my remarkably talented sister was living there. So before I went there, in spite of the work I did with my guidebook helping to plan our touring options, I really had no expectations. 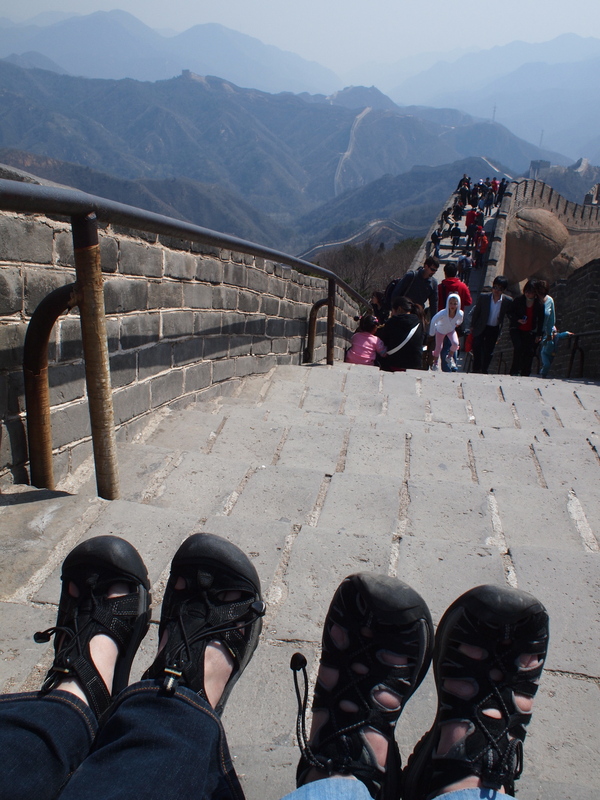 I somehow didn’t even realize that the great wall was so steep and that it was more like mountain climbing than like strolling. Your intrepid blogger and her sister having a little rest on the climb. Note the fantastic footwear. So there were a few things about China that really surprised me. Really surprised. Me. Culture things. Economics things. 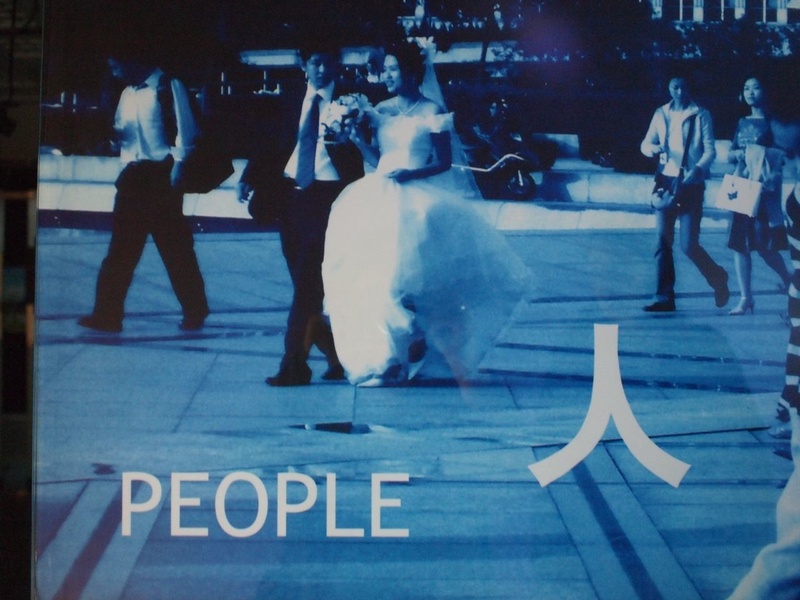 People things. Especially on my return to Britain and the world in which we live. Now my aim here is not at all to make any political judgements, it’s merely to pass along some information that has caused me to stop and think in a different way about problems currently facing Britain. A colleague recently introduced me to the concept of the Guardian’s 10:10 campaign, in which people in the UK (and the rest of the west, by example) pledge to reduce carbon footprints by 10% in 2010. I’m not here to argue against this campaign, or to suggest that being aware of one’s own energy consumption is a bad idea. But after visiting China last month, it’s really hard for me to see how this sort of thing can make any sort of a difference at all, beyond good PR and perhaps self-back-patting. China was, as I have mentioned before, a shiny disco nightclub. Take Piccadilly Circus, or Times Square in NY, and cube it. And again. And again. And again. For a while, ad nauseum. And then multiply it, proportionally speaking, with the number of cities in China with populations over 1 million. There are 60 and you’ve probably not heard of most of them. One of the things that was most striking to me on my visit was the lights outside of the main districts. Even a poor hole-in-the-wall restaurant with plastic chairs and tables inside (those that would be normally for outdoor picnics in the west) had neon signs and a well-lit visage. And I’m not criticizing in any way. As far as I could tell, bright lights and neon were a sign of “modern” China and thus something that was aspirational in the true sense of the word. But it seems to me that, after having seen this almost unbelievable aspect of China, a few tens of millions of Brits shivering in the dark during “Earth hour” or reducing their carbon footprints by 10% is unlikely to make a big change in the global sense. I pass no value judgements here. I’m not in any way suggesting that we should not be aware of our carbon footprint, and I’m in favor of trying to be as energy-efficient as possible in all situations, as good stewards of this fantastic planet that I love to explore. But I think it’s time to admit that until we figure out how to handle the developing world, including the very modern shiny disco nightclub that is China, we’re not likely to make a difference in the grand scheme of things but introducing war-like energy austerity measures in the relatively tiny UK. Taking the train from Nanjing to Shanghai on a rainy Sunday afternoon, it was hard not to notice the army of workers out in rain-suits working on the railroad tracks. Now admittedly it was only weeks before the opening of the Shanghai Expo, so this could have been a huge anomaly. But compared with everything else I saw in China, I’m guessing it wasn’t. The shops were open all day, every day. Important tourist sights were filled with security officers along with the plentiful souvenir shop and food stall workers. Whenever it was raining, people magically appeared at the entrances to the shopping malls to hand umbrella-shaped plastic baggies to all who entered, to keep the floors from getting wet and slippery. 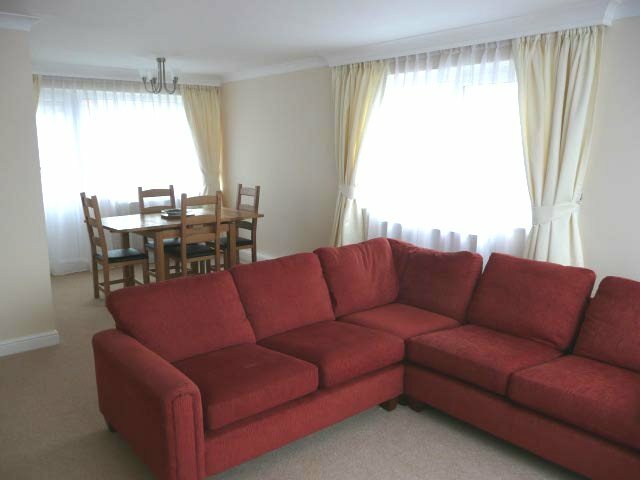 Everything was remarkably clean. All garbage bins had sections for recycling and they were never overflowing, even on the wicked-steep sections of the great wall. We actually saw a great wall cleaner lady, who was remarkably fit considering her age (greater than ours) walking along, picking up trash, and emptying the great wall garbage bins. (I admit I had no idea that there would be great wall garbage bins…) But that’s getting away from my main point. Everywhere you looked, people were working. I returned to the UK on my (thankfully) strike-unaffected BA flight, to a world where the flight attendants are striking, over and over, arguing about money and benefits that would seem amazing to the average Chinese person. There are over one billion of them in China. And surely the recent outcry over immigration reform and “British jobs for British workers” is being carried out in the face of the knowledge that there are many hard-working people in less fortunate countries who would really be quite happy to do jobs, such as BA flight attendant duties, at a fraction of what the current workers are fighting about. I admit it, in this case I was not so keen on the BA strike even before I headed to China. Striking in a recession seemed a bit foolhardy to me, and that was BEFORE the volcano gods started frowning on European air travel. Surely there are also plenty of people out of work here in Britain who would be happy to take those jobs. But if not, there are a whole lotta other people out there who clearly would. China changed me. I had read about it for a long time. I was familiar with the economic situation and how quickly it has changed in the last decade or two. But seeing it in person was something else entirely. Reading about a billion people did not mean much until I spent two weeks in those crowds. Reading about the developing economy did not mean much until I saw the shiny disco lights and the people employed to do the most small of tasks, like handing out plastic umbrella bags. China has itself changed, and quickly. Any economist is familiar with this concept but it’s amazing how visible it was to the casual tourist. But my overall impression was definitely one of, “There’s a new world order, it’s about to start changing in the west, so start bracing yourself now.” I can’t help but think that we are missing the elephant in the room when it comes to globalization, and although I had read that many times, it didn’t mean a thing to me until I saw it. I’ve started learning Chinese characters after my trip. (Admittedly with a fun iChinese app on my iPhone.) I’m convinced that the world, it is a-changin’. The scene: a nice hotpot restaurant in Nanjing. 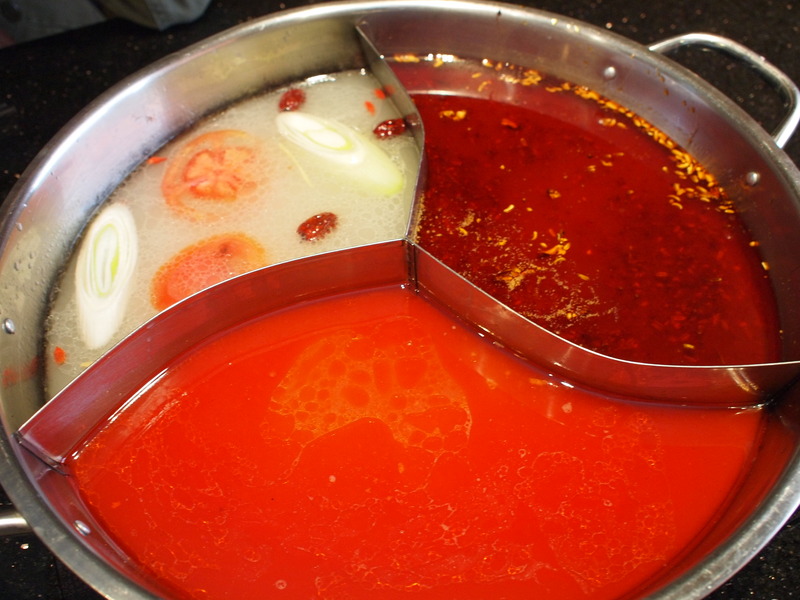 We had already been out for hotpot once before, at a more fast-food like place in Nanchang. Hotpot restaurants, for the uninitiated, are where you get a boiling kettle of soup on the table and a stack of uncooked ingredients to deal with on your own. Not to be confused with Korean Barbeque, when you get a stack of uncooked ingredients to deal with on your own and a live grill with charcoal in the center of the table. Totally different. (Ahem.) In either case, you cook your own food, and that is a good thing IMHO. But as a pescetarian who eats vegetarian much of the time, I was feeling a need for protein in my second round of hotpot, and I had this lovely mental image of small (salad-sized) shrimps that would cook to a lovely pink and be eaten. I was thinking in the manner of someone who lives in England, and finds small pre-cooked shrimps in a package at M&S. 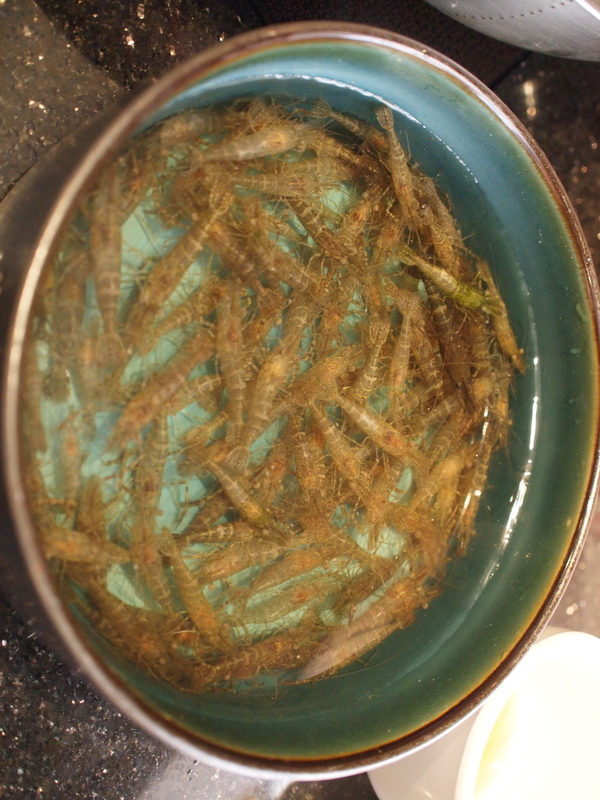 So it was a bit of a surprise to me when we ordered some small shrimps for our hotpot and they came in a bowl. Swimming. Alive. 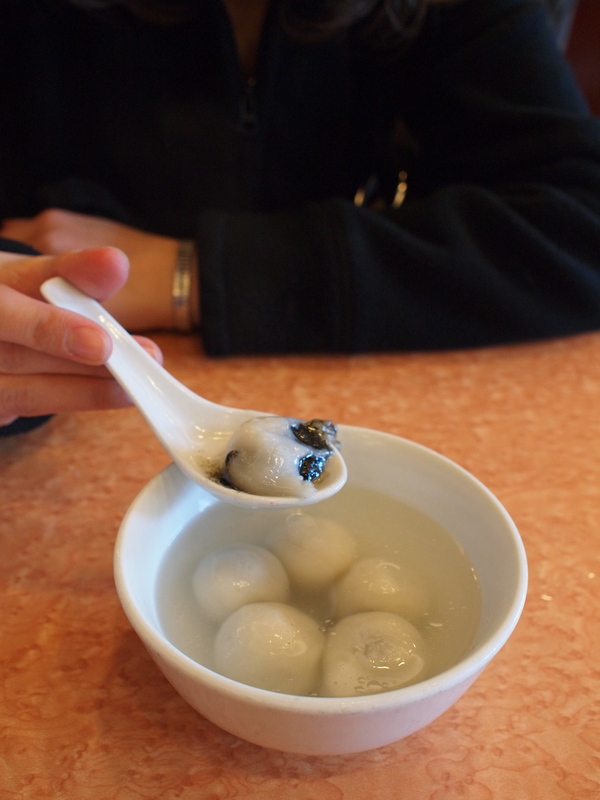 I had been trying so hard to be all “when in Rome” about the food in China, and I had tasted many things that were new to me, like glutinous rice balls. 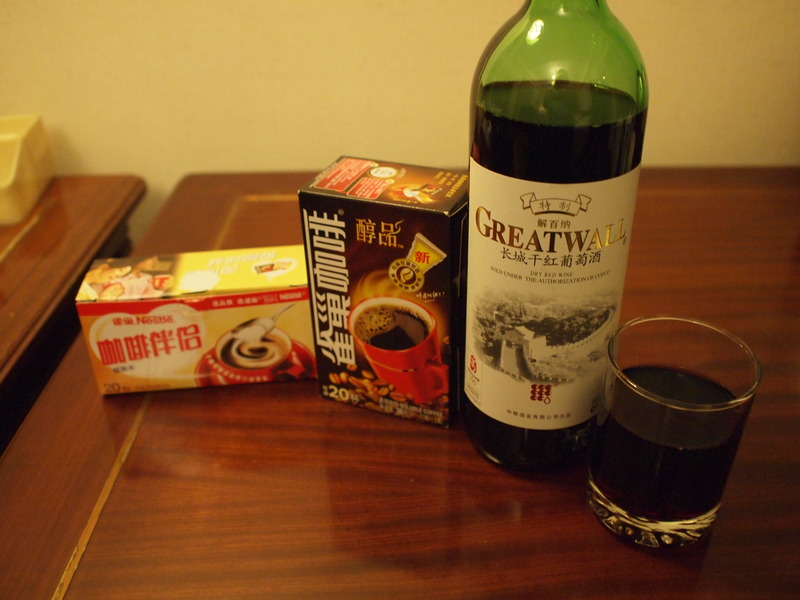 And I had been drinking Great Wall Red Wine. But I could not contend with the living shrimps. I balked. I admit it. I could not drop them in the boiling soup to die and to be eaten. Especially with their shells and feet and antennae, which apparently the Chinese spit out. On the table. In the manner of fish bones. Another story there, for another day. I told my sister that I was balking and tried to just eat hotpot with the vegetables with the live shrimps over on the side in their bowl, never reaching the boiling soup. It was all fine until they started jumping to their doom. Two of the shrimps made it out of the bowl of water and were flailing around on the table near the burner where the hotpot soup was cooking. I could not take it any more. I had to ask my sister, with her proficient Chinese, to get the waiter to take the live shrimps away and to save me from this mess. It was embarrassing. And expensive. We paid a lot of money for those small shrimps that we never ate. My enthusiasm for hotpot has not diminished, but I do think that I’m quite happy with cabbage and tofu and the like in the manner of vegetables.